The vocal lip-smacks that geladas use in friendly encounters have surprising similarities to human speech, according to a study reported in the Cell Press journal Current Biology on April 8th. The geladas, which live only in the remote mountains of Ethiopia, are the only nonhuman primate known to communicate with such a speech-like, undulating rhythm. Calls of other monkeys and apes are typically one or two syllables and lack those rapid fluctuations in pitch and volume. This new evidence lends support to the idea that lip-smacking, a behavior that many primates show during amiable interactions, could have been an evolutionary step toward human speech. "Our finding provides support for the lip-smacking origins of speech because it shows that this evolutionary pathway is at least plausible," said Thore Bergman of the University of Michigan in Ann Arbor. "It demonstrates that nonhuman primates can vocalize while lip-smacking to produce speech-like sounds." 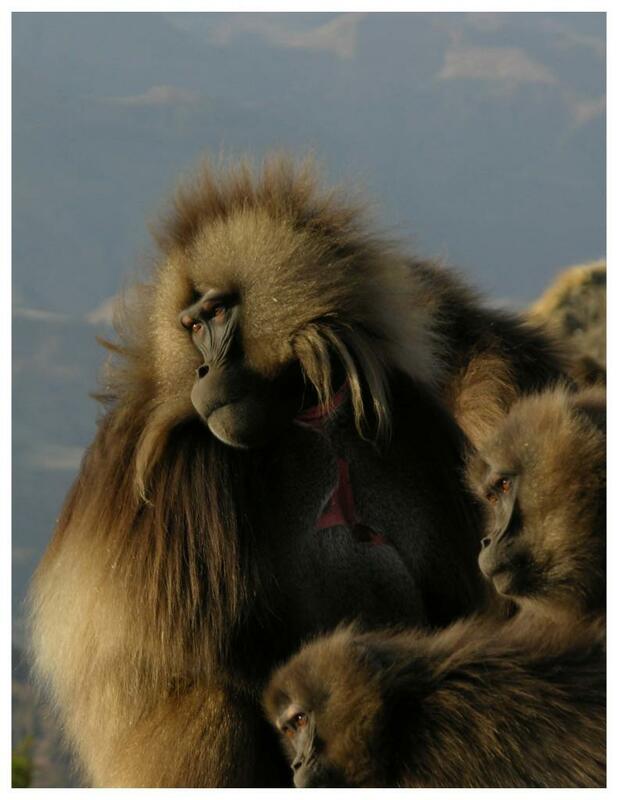 Bergman first began to wonder about the geladas' sounds when he began his fieldwork in 2006. "I would find myself frequently looking over my shoulder to see who was talking to me, but it was just the geladas," he recalled. "It was unnerving to have primate vocalizations sound so much like human voices." That was something that he had never experienced in the company of other primates. Then Bergman came across a paper in Current Biology last year proposing vocalization while lip-smacking as a possible first step to human speech, and something clicked. Bergman has now analyzed recordings of the geladas' vocalizations, known as "wobbles," to find a rhythm that closely matches human speech. In other words, because they vocalize while lip-smacking, the pattern of sound produced is structurally similar to human speech. In both lip-smacking and speech, the rhythm corresponds to the opening and closing of parts of the mouth. What's more, Bergman said, lip-smacking might serve the same purpose as language in many basic human interactions—think of how friends bond through small talk. "Language is not just a great tool for exchanging information; it has a social function," Bergman said. "Many verbal exchanges appear to serve a function similar to lip-smacking."